The taste and texture of your crust will either make or break your pie. Simply put: if you've perfected the crust, you have yourself the perfect pie. What you put in it doesn't really matter. Any kind of fruit will do. Or chicken. If you like baking pies... or eating pies, here are the two essential items you must have in your kitchen. They will work miracles and magically bake you the perfect pie. I mean it. It's pure magic. 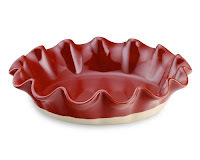 A few weeks ago, I was browsing various kitchenware websites (this girl likes to shop) and I came upon an Emile Henry Pie Dish that had a ton of positive reviews. People were using words like "magic" and "only dish you'll ever need." Intrigued that so many people were raving about it as if it was their first-born, I did some more research on its specs. Each pie plate is made by hand, out of Bulgundian clay. No kidding! They had this awesome video showing how it's made. I saw this plate still in wet clay form, sitting on a wheel, with a man smoothing out it's ruffles.. then hand dipping it in the red glaze. Amazing! It gets better. The clay distributes heat evenly, giving you the perfect golden bottom crust! 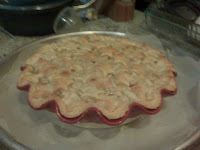 (Have you ever baked a pie and was disappointed to see that your bottom crust was a white and soggy doughy consistency? Yuck!) The glaze finishing on the pan is scratch resistant to any kind of sharp pie server. It's also microwaveable, freezer safe, and dishwasher safe. Sweeeet! Plus, need I say that it's simply gorgeous? Ok so, I had to have one. But when I saw the price, I almost had a heart-attack. $44 for one plate. And I thought "ok, with all the raving reviews, I have to try it out. I'll take it back if it's not up to par." So I brought it home and put it to work. I baked a pie and sent it over to Kelly's (my BFF). Immediately, her family noticed a difference in my pie quality. They couldn't stop raving about how yummy it was- especially the crust! So I ended up driving over to her house, sliced a piece, and flipped it upside down. Lo and behold- the bottom crust was a PERFECT golden brown. I wanted to cry. It was so beautiful. I had finally perfected my pie. And it tasted amazing! It was the best tasting pie I had ever made. But ok, so alo ng with this pie pan, I also made another splurge. 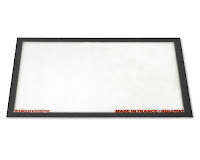 I bought a $50 pastry mat and went through the same thought process... sooo expensive, will take back if it's not what it's cracked up to be. It also got excellent reviews and people saying that it's worth every penny. Upon first glance, you probably think you don't need one of these. But I was pleasantly surprised at how useful it really is. First of all, it's huge. It takes up a good size of your counter, so it allows you to roll out a big piece of dough, even for the largest pie pan. (1) You don't have to flour the surface or the dough at all. This is incredibly important, especially for pie dough because putting excess flour into your dough will change its consistency, which makes it harder to work with and it will ultimately change the texture and taste of your crust. (2) It makes it so that delicate doughs like pie crust, lifts off easily, in one sweep. This is important, because when you're rolling out a large piece for the bottom crust, it is easy to break it when lifting it off of your rolling surface, if you don't have a non-stick surface (or if you're relying solely on flour as a non-stick mechanism). The last quality is something people don't often think about, but it's an important factor to consider. The sticky back side of the mat makes it grip to your counter with the jaws of death. It won't move or slide on your counter when you're rolling. 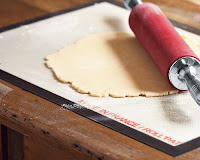 This is super important when rolling out pie crust because in mid-roll, if your rolling surface shifts under your weight, you'll get an uneven piece in terms of thickness, which will result in it baking unevenly. 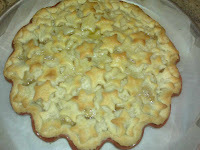 Here are some pictures of my most recent apple pie. The fluted edges of the Emile Henry pie dish give it the most beautiful ruffles. (Sorry for the bad picture quality- took these on my blackberry). 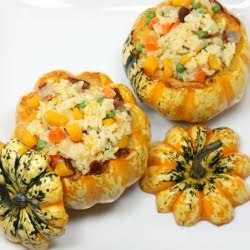 Now I really really want to get the mini 5 inch EH dishes so I can make cute little individual pies! Would it be perfect for chicken pot pie dinners? I would definitely recommend these products to anyone who's into pie baking, especially if you're a beginner. It will make your life so much easier. To me, it's well worth the investment. They are two very high quality pieces and will last a very long time, if not a life time if you take good care of it. If you're still skeptical, I would suggest doing what I did. Buy it to try it out and if you're not completely won over like I was, you can always take it back! But I have a feeling that you won't want to part with either one of them! I have definitely noticed a difference in both quality and taste of my pies ever since working with these two amazing products! Oh and yes, I LOVE my silpat! Those mats are definitely worth every penny. Good to know! I've been eyeing that pie dish - is it difficult to get a slice out of the dish with those fluted edges? Thanks! Annie, you should definitely get it. It's well worth the investment! =) I actually thought it would be difficult to get the pie out, too. But actually , it works just fine! I've never had trouble with it. I think it's because of the great coating/glaze they've got on the pan.. and also, the pie crust itself has a lot of butter in it too.